NORTHAMPTON, Mass.- On November 17, Northampton’s Pride & Joy will hold its grand re-opening celebration. Since its inception in 1992, this store holds a special place in the hearts of the LGBTQ family. It is a destination, a rite of passage, and a top destination to buy fun queer gifts and Northampton souvenirs. The new co-owners, Jennifer Harlan and Joy Rain, purchased the store over the summer and have been steadily working to create a renewed sense of energy, passion, and enthusiasm for the store. The first step included moving the store to Thornes Marketplace, which is Northampton’s favorite place to shop on Main Street, they said. Just down the hall from Herrell’s Ice Cream and across from Left-Click, this much larger location offers customers the chance to enjoy shopping on both the upper and lower level of the store. With the facelift also comes the store’s new tagline Harlan explained. The acting Mayor, David Narkewicz, and Northwestern County District Attorney, David E. Sullivan, will participate in the ribbon cutting ceremony at the grand re-opening. 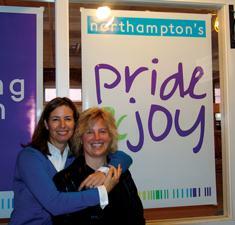 Northampton has a long-standing reputation of being one of the most progressive cities in the U.S. and is often cited as the “lesbian capital of the U.S.,” said Rain. “Our store is truly a celebration of the city and is the go-to store for Northampton souvenirs and gifts,” she said. Northampton Pride & Joy’s Grand Re-opening is a historic day in the community, a day that says our retail store will live on. So, come be part of history and shop! Cutline: Army veteran Aubrey Sarvis, executive director of Servicemembers Legal Defense Network. Be the first to comment on "Northampton’s Pride & Joy launches anew, grand re-opening celebration at new location"